While the summer may be coming to an end, the inaugural Toronto Food & Wine Festival (@TOfoodandwine) is one great reason to look forward to September. Taking place at Evergreen Brick Works from September 18-20th, 2015, this three-day festival will be quite the epicurean event and I’ve got a pair of tickets to give away! – The Grand Tasting Pavilion will feature 130 purveyors of premium products. There’s a fantastic roster of local food and restaurants, wines, beers and spirits. Look out for local favourites including the Cheese Boutique, Enoteca Sociale, Farmhouse Tavern, Mary Macleod’s Shortbread and Station Cold Brew Coffee, to name a few. – Cochon 555 will be holding their first-ever Canadian events during the first two days of the festival. Cochon 555 is a one-of-a-kind traveling culinary competition and tasting event that helps support family farms and raise awareness of the importance of heritage pig farming. Friday will feature a Heritage BBQ competition between 5 notable chefs who will create signature dishes using the entire pig from nose-to-tail. – Expert-Level Educational Workshops – get up close and personal with some of your favourite chefs and culinary professionals during these hands-on workshops which will take place all weekend long. 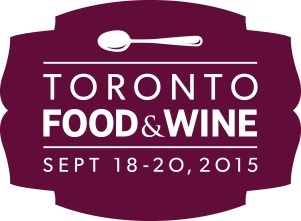 I’m giving away one pair of tickets to the Toronto Food & Wine Festival (value $64). The contest ends on Tuesday, September 1st at 11:59pm. A winner will be randomly selected and announced shortly thereafter. Enter via rafflecopter below. You can tweet once per day for extra entries. Good luck! Looking forward to the great looking food ! I am looking forward to the Chef’s Talk Series. Tasting some of the delicious food. Nice way to wrap up Summer. Can’t wait for Chuck Hughes! Love to learn more bout new wines! I can’t wait to find my newest food obsession. Probably a dessert. a fine selection of wines and snackies! Looking forward to see the celebrity chefs! The line-up for this event looks fantastic! Love to see all the new products and offerings from vendors I know and new ones too!